No oven, no joke! 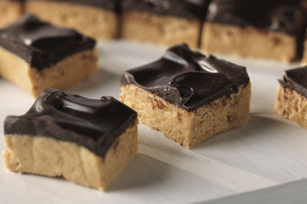 Our No-Oven Peanut Butter Squares are prepared with the help of a microwave in 10 minutes flat. The hardest part of this recipe is waiting for these sweet treats to cool! Line 13x9-inch pan with foil, with ends of foil extending over sides. Microwave butter in large microwaveable bowl on HIGH 45 sec. or until melted. Add sugar, graham crumbs and peanut butter; mix well. Spread onto bottom of prepared pan. Melt chocolate as directed on package; spread over dessert. Cool. Cut partially through dessert to mark 48 squares. Refrigerate 1 hour or until firm. Use foil handles to lift dessert from pan before cutting into squares. Reduce chocolate to 1 pkg. (225 g). Prepare recipe as directed, using 9-inch square pan. Cut into 24 squares to serve. Makes 24 servings, 1 square (52 g) each. For a crunchy peanut butter treat, prepare using Kraft Crunchy Peanut Butter.